NEW YORK, Feb. 7, 2019 /PRNewswire/ -- Humanscale Healthcare, the premier designer and manufacturer of ergonomic products, today announced that it will be showcasing its MedLink Mobile Technology Cart along with its full range of point-of-care solutions at HIMSS19 in Orlando, FL, at Exhibit Hall 4171 from February 11-15th. The seamless customization and exceptional design of Humanscale Healthcare solutions gives caregivers and industry professionals the confidence and ability to give better care with an unparalleled product. MedLink™ Mobile Technology Cart:MedLink is a revolutionary point-of-care solution. It represents North America's only closed-loop medication system—using lockable drawers and patient wristband scanning to ensure safe, accurate medication administration. MedLink is specifically designed to reduce human error, keep patients safe, and streamline caregiver workflows. MedLink is fully customizable to meet any healthcare organization's software integration needs and is compatible with most existing IT infrastructure and workflows. 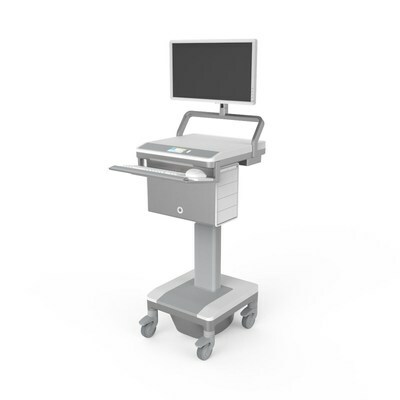 T7 Mobile Technology Cart:The T7 line of mobile technology carts addresses all of the technical challenges present in today's healthcare environment. TouchPoint carts provide caregivers with a simple, comfortable and effortless way to bridge the gap between patient care and technology. With seamless digital integration, caregivers are able to give more comfortable patient care. Auto Fit™ technology adjusts to each caregiver's height, providing effortless height adjustment and comfort during extended use while caregivers sit or stand. Power Track™ steering gives caregivers the ability to navigate tight spaces, corridors and turns with one-hand operation for care on the go, all with the squeeze of a button on the cart handle. V/Flex ViewPoint Technology Wall Stations:The V/Flex offers the ultimate in comfort for caregivers. Flexible and adjustable arms improve patient-caregiver interactions, and the sit/standability of the wall station allows each caregiver to adjust it to their correct height, supporting 98% of caregivers. V6 ViewPoint Technology Wall Stations:These flexible monitor arms promote patient-caregiver interaction, and support caregivers in both seated and standing positions. The V6 can also be configured with an accessory mount or rail for peripheral shelves to store gloves, wipes, and other common items. "Our goal at Humanscale Healthcare is to provide efficiency to caregivers, safety, and the utmost quality of care to patients," says Heather Fennimore, Founder, President, Global Healthcare at Humanscale. "This year, we are thrilled to announce advancements in our product line and to offer North America's only closed-loop medication system to enhance patient care even further and unparalleled accuracy in other forms of delivery." Our design-led approach frees caregivers to focus on what matters—patient care. Our solutions streamline everyday workflows and encourage effortless interaction with patients. We help caregivers prioritize their patients and offer better care.